- One Eyed Reilly, "Trad Music Nightly"
I'm fond of the new Irish pub to which I can walk from my house. I owe them quite a bit, actually, and not the bar-tab kind of way. Father Paddy's Public House popped into existence in Woodland last year and brought to us the things that I would consider a prerequisite for such an establishment, such as decent beer on tap and fine plate of fish and chips, but also something I hadn't thought to expect. Live local music. 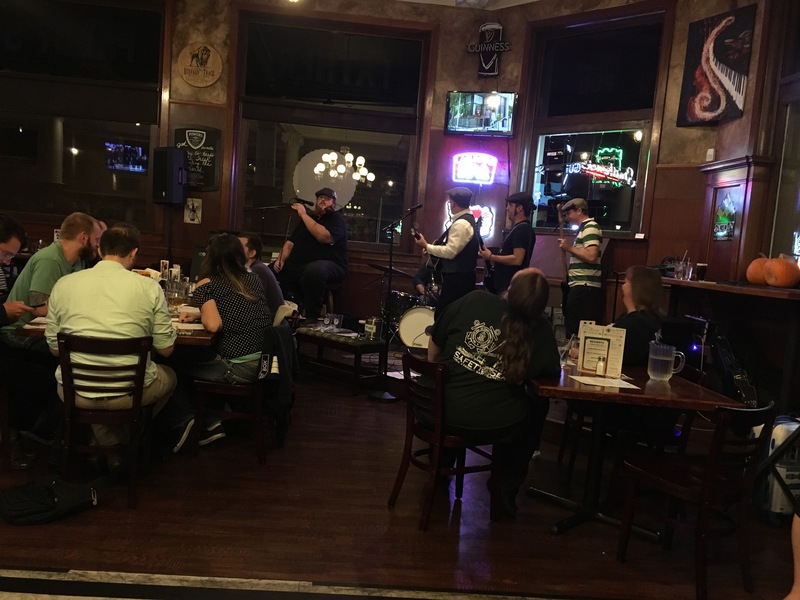 Specifically live local Irish music, which I didn't even know we had around here. Turns out we have quite a bit of it. Casting around for something do last November, with family in town and a serious case of post-election depression on, we walked into Father Paddy's to hear One Eyed Reilly, who play this awesome mix of folk and rock with a dash of Charlie Daniels or Pink Floyd or whatever else they feel like throwing in. And I found myself actually smiling. And their fiddle player? Holy crap! Very few bands can cover Flogging Molly and match Bridget Regan in my estimation. This guy can. One Eyed Reilly led us to Irishpalooza at Harlow's in Sac, which introduced us to whole host of cool local bands. Now I'm listening to The Pikeys in my headphones and wearing my Whiskey and Stitches t-shirt while I checkout the events schedule at the pub. I don't know if this is a new thing or not, but this whole deal where local venues are starting shows at 6 or 7pm instead of 9 is sort of a godsend for parents. Not only is it possible for old people like me to go to a show, but it means I can bring my kid along where appropriate and introduce him to cool music. Very appreciated. So Woodlanders, and general Sacramento-area folks, here what I've been listening to. And if you're not from around here, well, the internet pretty much means everyone's from around here, right? So cheers to Father Paddy's and to all my new favorite bands. See you guys around? And on a non-local but still related side note, if you haven't checked out Dropkick Murphys new album, it's also worth some time in your ears. I particularly like the one about the hat. Hey! Thanks for the awesome words, that night was an amazing night of music. I am just blown away that you took the time to look up my band the Pikeys, our brothers in One Eyed Reilly, and the very kick arse Whiskey and Stitches. Also, I could not agree with you more on how great it is to have shows start early. I usually get home around one or two in the morning, so being able to make it home before my six year old daughter falls asleep is priceless. Hope to see you in March! It was such a great show! It was such a great show! Stepping Stones was fantastic too, but I couldn't find them anywhere out there in the wilds of the internet. :-( I'll have to watch event schedules to catch them again. Yep, have to agree with every word - except for the living in Woodland bit, and the having a kid bit, and, of course the fish bit, and.. :-). What a fun night! Now all I need is one of their shirts in tech instead of cotton so I can wear it running. And Dropkick Murphy's have a new album? Missed that somehow. More music! *Murphys* - darn apostrophe. I need to learn grammar again. Yep, and Flogging Molly has been in the studio recording a new one. Looking to be a good year for music. Thank you so much for the very kind words. I've got a lot to live up to on the fiddle. So many great artists out there locally. Mike Dalton is a monster on the guitar in The Pikeys. We had so much fun playing at Irishpalooza. The Pikey's and Whiskey and Stitches are so much fun to play with on the same bill. They are such good musicians. The boys in OER love playing Father Paddy's. It is one of the best pubs I've ever visited. So glad we get to play there. As a matter of fact, we are there tonight from 7-10. See you soon! Take care. Thank you again for the very nice article!